Committee meetings, broad bean dip and Sardinian parchment bread. It seems I am still somewhat discombobulated. It didn’t occur to me until I received a late agenda that I had a kinder committee meeting last night. Pretty silly of me considering it was clearly written on the calendar. Furthermore, I had no idea at all that it was my turn to bring food. A quick check of the pantry and the garden saved the day. I whipped up a batch of hommus in the thermomix as well as a broad bean and feta dip. Some Sardinian parchment bread completed my offerings. 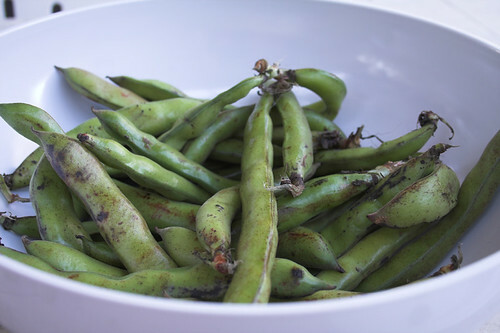 Cook broad beans until tender in boiling water. Cool and peel outer skin. Divide into 24 evenly sized balls. Roll out as thinly as possible. Place each piece on an ungreased baking sheet and bake for 3 – 4 minutes per side or until each side is golden. Going to try this bread over the weekend….love flat breads and this sounds T-rrific! You really are going through a broad bean phase…do you grow them??? T’Mixer, super fast is the only way, especially for pesky old committee meetings! It has to be quicker than running down to the supermarket. Or near enough anyway. I do grow them Tenina. Mainly though I try to eat locally which means gorging on things as they are in season, especially short local seasons like broad beans. Sad news about the farmers market…here I had been thinking that Australians were much more progressive, imagining all the inner-city markets as booming and bustling. Man, that is too bad. Sorry HDR, it vanished too quickly. There are some bustling ones in the inner city area. For some reason, not this one though. Hopefully it will improve.